1935: The First Full Year Under The Draconian Production Code (Post Nine) | THAT'S ENTERTAINMENT! Welcome to another Film Friday! Today we’re finishing our series on films released in 1935, the first full year in which Hollywood studios were forced to adhere to the Production Code, which became official in the summer of 1934. The pictures we’ve been looking at are not connected by performers, but rather by their common bond to the censoring of creativity. So far we have covered The Goose And The Gander, Dangerous, No More Ladies, Star Of Midnight, Alice Adams, Goin’ To Town, The Gilded Lily, and Becky Sharp! 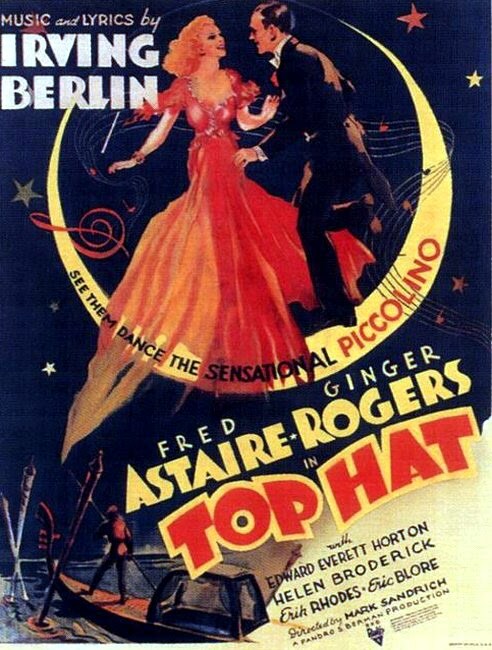 I’ve saved the best for last, and today we’re looking at Top Hat! 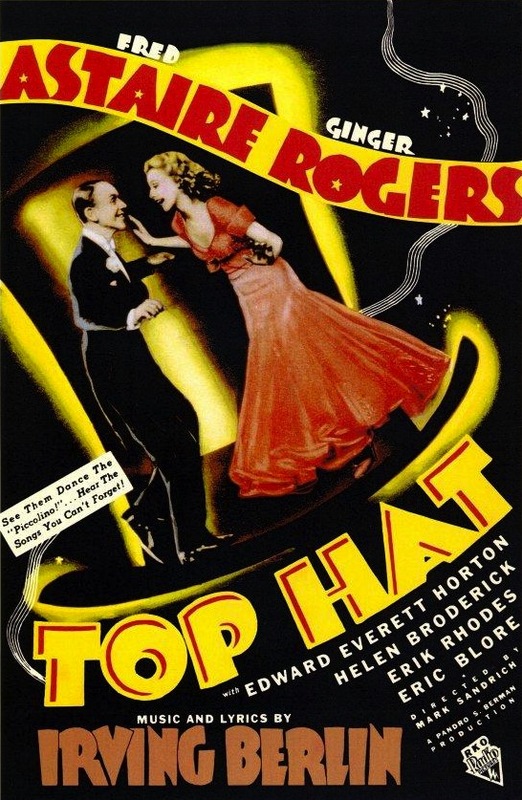 Starring Fred Astaire, Ginger Rogers, Edward Everett Horton, Erik Rhodes, Eric Blore, and Helen Broderick. (Plus Lucille Ball in a bit role.) Screenplay by Dwight Taylor and Allan Scott. Story by Dwight Taylor. Directed by Mark Sandrich. I briefly discussed this classic movie musical in last week’s Wildcard post on Broadway composers going Hollywood. 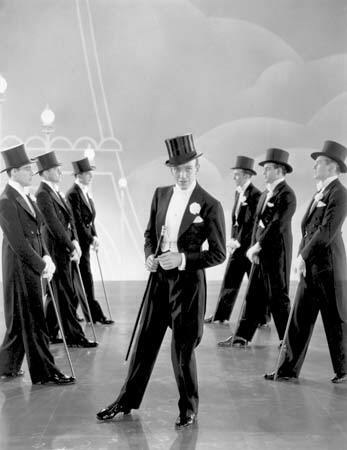 With truly one of the greatest film scores of all time, Astaire and Rogers sparkle in this frothy, trivial, hilarious farce that benefits from the inclusion of five excellent Irving Berlin tunes. And the dancing — oh, the dancing! 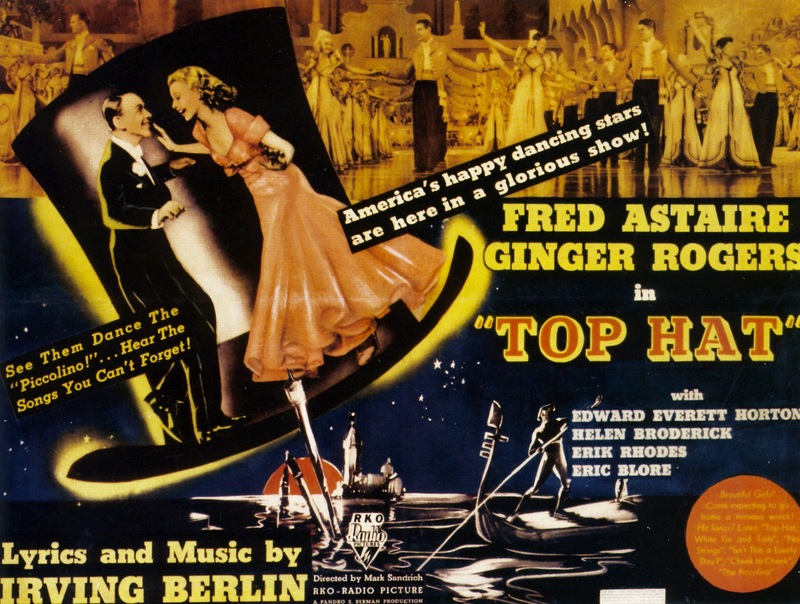 While staying in a London hotel with his English theatrical backer, Horace Hardwick, American musical revue star Jerry Travers wakes up Dale Tremont, Horace’s downstairs neighbor, with his compulsive tap dancing. Upon seeing the furious Dale, Jerry falls instantly in love and, in spite of her snubbing, daily sends flowers to her room. Then, while posing as a hansom cab driver, Jerry delivers Dale to her riding lesson in the park and romances her in a pavilion during a rain storm. Dale’s loving bliss is shattered, however, when she incorrectly deduces that Jerry, whose name she has never heard, is actually the husband of her matchmaking friend, Madge Hardwick. 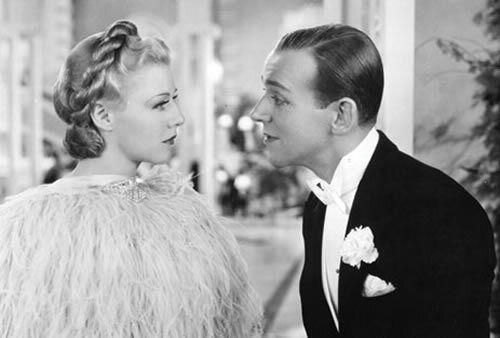 In spite of her desire to return to America, Dale is convinced by Alberto Beddini, her adoring, ambitious Italian dressmaker, to accept Madge’s invitation to join her in Italy. Before leaving, Dale encounters Jerry in the hotel and slaps him without explanation. Worried that the slap will cause a scandal, the hotel management admonishes a confused Horace, who in turn blames the incident on Bates, his quarrelsome valet. 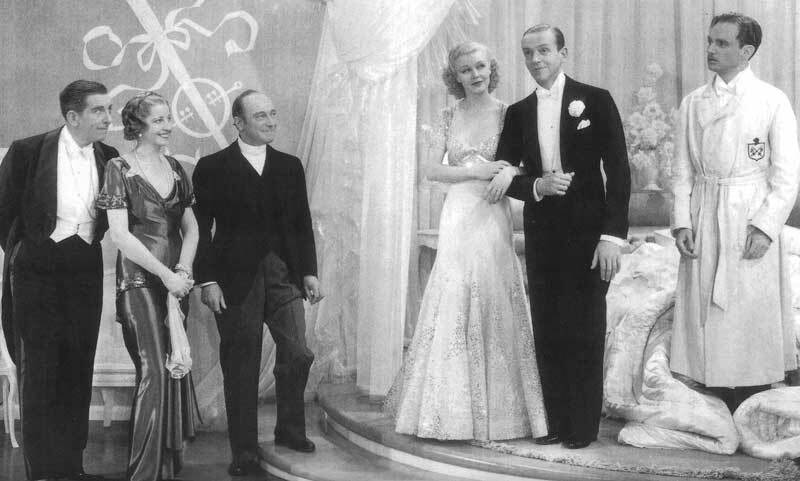 After Horace orders Bates to follow Dale, he receives a telegram from Madge saying that Dale is on her way to the Lido in Venice. Overjoyed, Jerry rushes through his London revue and flies to Venice with Horace, unaware that Dale has confessed to Madge in their hotel room that her husband has made illicit advances toward her. 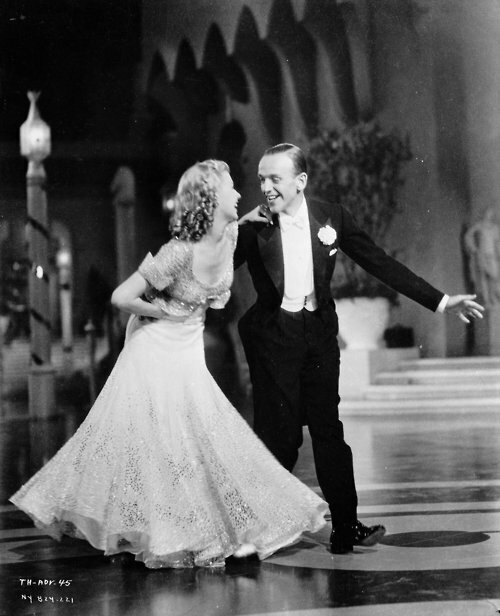 Okay the story is so silly — stemming entirely from Roger’s mistaken notion that Astaire, the tap-dancing fool who romanced her under a pavilion during a during a rainstorm, is actually the husband of her best friend, the gamey Helen Broderick. And after that’s set up in the first 30 minutes, we get 70 minutes of repercussions. 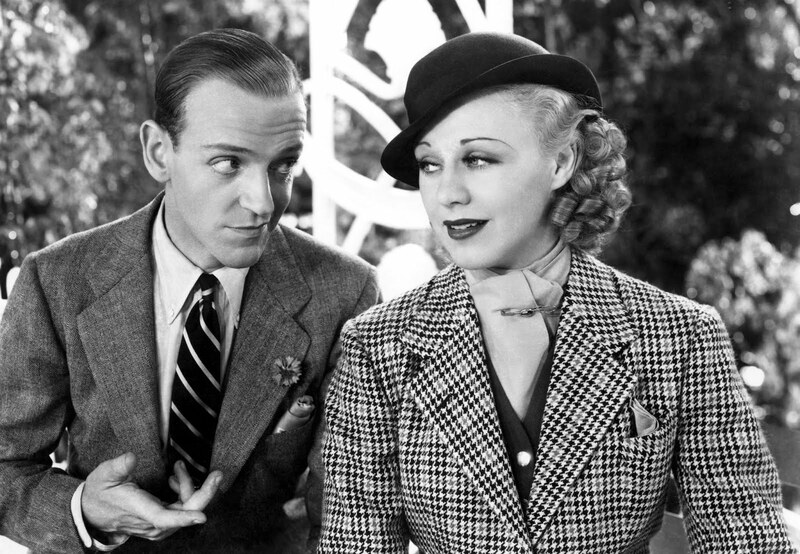 While not meaty enough to be considered a full fledged screwball comedy, the premise certainly has elements of farce — ideal for a staged musical comedy. (It was finally adapted for the West End in 2011, filling out the score, so as to disguise the thin plot, with more famous but undersung Irving Berlin songs.) The scarceness of the plot is not a hinderance to this 99 minute film; the simplicity of the proceedings is refreshing. Story beats and character moments are given space to play out in both comedic and dramatic fashions. Furthermore, the story doesn’t distract from the main attractions — the stars, the dancing, and the score. For the rest of the dance numbers, you’ll have to check out the film for yourself, which needless to say, comes highly recommended! Come back next week as Film Friday launches a new series of posts! And tune in on Monday for the start of a whole new week on That’s Entertainment!